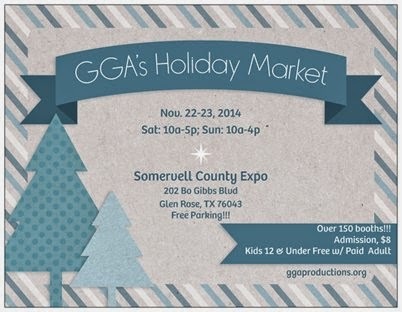 "We will have everything from hand made jewelry and Christmas items to Birdhouses and yard art. There will be a door prize drawing every half hour and a Silent Auction held every hour during the day. Some items in the Silent Auction are a brass punch bowl set, beautiful fall and Christmas wreaths, gift cards from local merchants and more. We will be serving a home cooked turkey dinner from 11 AM to 2 Pm for $6.00. Please come and join us for a day of fun and fellowship." "This fun and FREE event will showcase handmade holiday gift items made of fabric, wood, ceramic, and glass. Other exhibitors will have jewelry and clothing for adults and children, along with candles and soaps. There will also be a wonderful selection of salsas, jams, nuts and dips for gifts or holiday parties. In addition, Collin County seniors will stock the Hip Hip for Gray booth with a variety of crafts including quilts, baby items, ornaments and more."